New York Times, vividly brings this story life. One of the great true detective stories of the 20th Century: deciphering the symbols pressed into 3,000-year-old clay tablets found in Crete in 1900. The challenge: the language, dubbed Linear B, is unknown, and so is the alphabet in which it’s written. Sounds impossible, yet it was accomplished by an odd assortment of folks including an archaeologist, an architect for whom Linear B was an all-consuming hobby, and a Brooklyn College classics professor, Alice Kober, the unsung (until now) heroine in the piece. Fox, the brilliant senior obituary writer at The New York Times, vividly brings this story life. 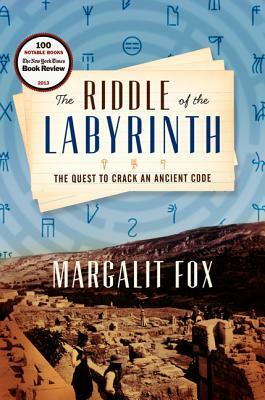 In the tradition of Simon Winchester and Dava Sobel, The Riddle of the Labyrinth: The Quest to Crack an Ancient Code tells one of the most intriguing stories in the history of language, masterfully blending history, linguistics, and cryptology with an elegantly wrought narrative. When famed archaeologist Arthur Evans unearthed the ruins of a sophisticated Bronze Age civilization that flowered on Crete 1,000 years before Greece’s Classical Age, he discovered a cache of ancient tablets, Europe’s earliest written records. For half a century, the meaning of the inscriptions, and even the language in which they were written, would remain a mystery. Award-winning New York Times journalist Margalit Fox's riveting real-life intellectual detective story travels from the Bronze Age Aegean—the era of Odysseus, Agamemnon, and Helen—to the turn of the 20th century and the work of charismatic English archeologist Arthur Evans, to the colorful personal stories of the decipherers. These include Michael Ventris, the brilliant amateur who deciphered the script but met with a sudden, mysterious death that may have been a direct consequence of the deipherment; and Alice Kober, the unsung heroine of the story whose painstaking work allowed Ventris to crack the code. An award-winning journalist trained as a linguist, Margalit Fox is a senior writer at the New York Times. She holds bachelor's and master's degrees in linguistics from Stony Brook University and a master's degree in journalism from Columbia Univer-sity. She lives in Manhattan with her husband, the writer and critic George Robinson.